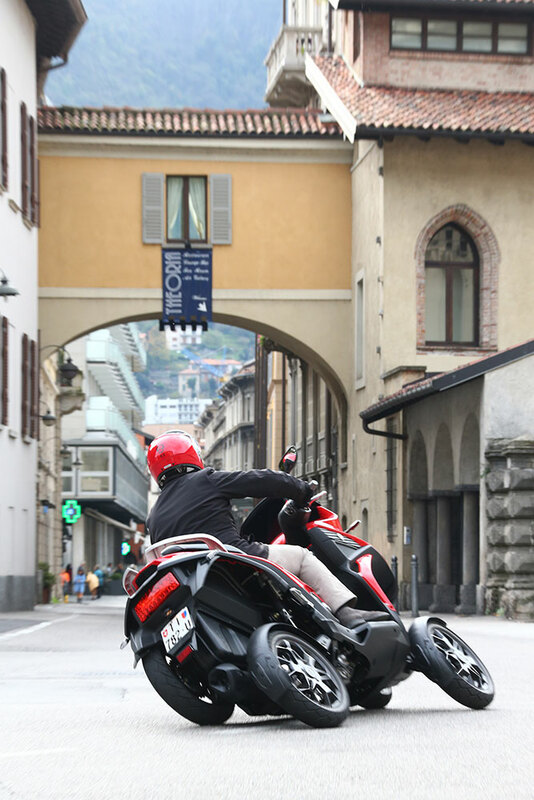 Founded in 2011, Swiss transportation company Quadro has taken the concept started by Piaggio’s MP3 and taken it a step further. That is, they’ve taken in a wheel further. Offering both three and four wheel vehicles, Quadro seeks to blur the line between single-track vehicles and traditional cars. Perhaps best described as “narrow track” these vehicles attempt to blend the urban advantages of a motorcycle or scooter, but add a greater degree of traction and capability. 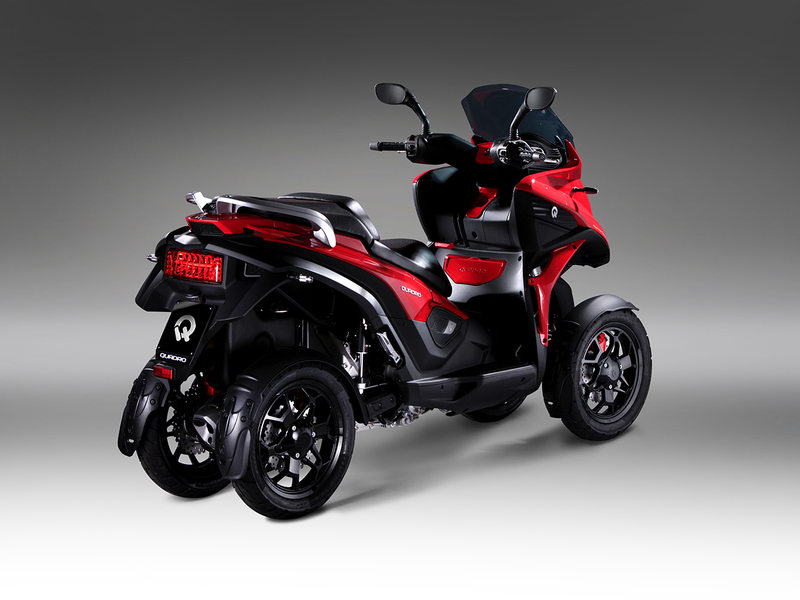 Piaggio has already proven this with the MP3, whose dual front wheels increase both grip and braking power. The offset of those two wheels, consequently, also makes a leaning vehicle of this type nearly impossible to low-side. With Quadro adding a second wheel to the rear as well, that’s all the more grip now for the rear end of these vehicles as well. However for all the similarities the Quadro lineup might have in initial appearance to Piaggio’s MP3, on closer inspection these are very different vehicles. 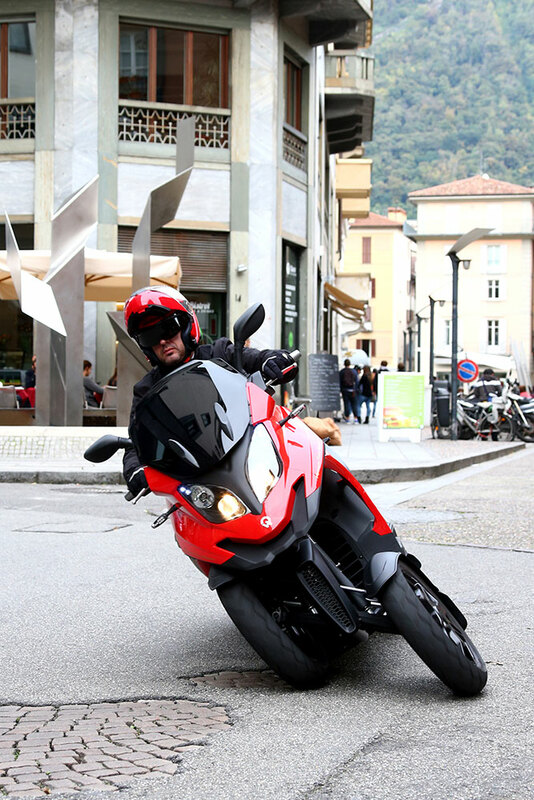 The extra wheel in the rear not withstanding, the suspension design on the Quadro is fundamentally different than the Piaggio setup. Where the MP3 is essentially a pair of single-sided front forks attached to a set of parallelogram pivots, the Quadro uses a suspension similar to an ATV. The shocks are further inboard of the wheels and a set of more conventional A-arms allow for both suspension travel and tilt because they essentially share their central pivot point. In both cases, it is the vehicle’s center of gravity that initiates and maintains the lean angle, which allows the Quadro to still ride like a conventional two-wheeler. The Quadro literature describes the suspension as a hydraulic system, yet what’s unclear is whether or not there is some sort of hydraulic dampening in the lean mechanism, or if that’s simply referring to the struts helping keep the wheels planted. The latter is more likely, as an extremely sophisticated ride-by-wire system would be needed to otherwise regulate lean. Quadro offers a number of different models, with a mix of three and four-wheel configurations, each in the 350cc engine range. The Quadro4 weighs in at 567 lbs with those extra wheels and the suspension to run them obviously adding some mass to the Quadro as compaired to its 2-wheel contemporaries. Thought of another way, the size and weight of the Quardro are roughly equivalent to a BMW C-series scooter, yet the Beamer is making twice the power. Yet horsepower certainly isn’t everything. Smaller displacement should net out higher fuel economy for the Quadro overall. Obviously where the Quadro lineup stands apart is in its available four-wheel configuration. With integrated braking on all four wheels, the Quadro4 should stop very aggressively. That said, my personal preference is still to balance my braking myself front-to-rear. It’s also surprising that a vehicle this advanced doesn’t include ABS. Overall, the offerings from Quadro are really interesting. 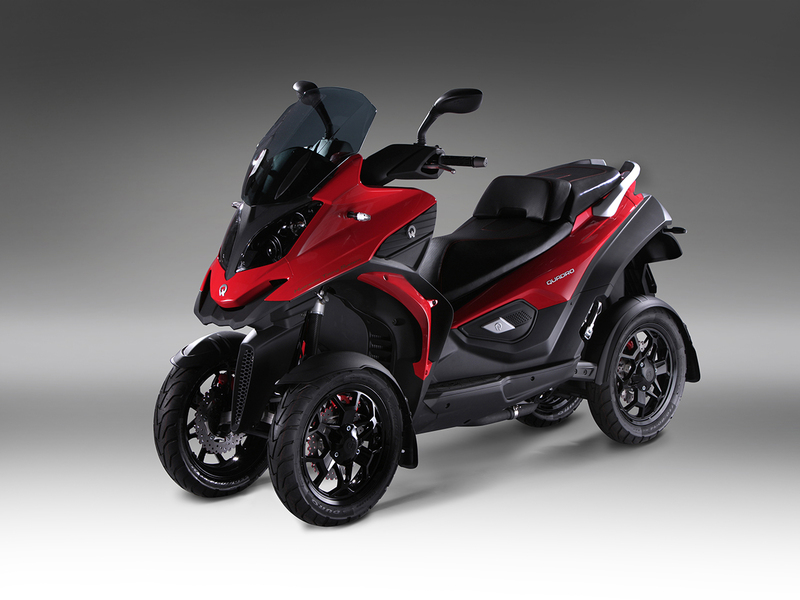 Currently available across the EU, Quadro is even experimenting with interesting concept vehicles. This has included a 100% electric model, and at EICMA this year, they even brought an adventure concept.